Ted Heath was born in Wandsworth, London into a musical family in 1900 and by his early teens was playing the trombone. The 1920s were a difficut economic time and after some unsatisfactory attempts at non musical employment Heath ended up in a busking band in the West End of London. He became a professional musician in the early 1920s and played with a number of bands including the Southern Syncopated Orchestra, Harry Lester's Cowboy Syncopators and then Jack Hylton. After brief spells with Bert Firman and Al Starita he was back to Jack Hylton for two years followed by eight years as an Ambrose sideman. A spell with Sydney Lipton was followed by a long spell through the second world war (1939-45) in the Geraldo band where he was section leader. His technical proficiency saw him as a 'sessioneer' on hundreds of studio dates. In 1942, with his wife, Moira, he wrote a hit tune, A Lovely Weekend. Largely due to Glenn Miller, 'swing' music was 'the rage' and Heath - a quiet, tee-totaller, non-smoker and strict disciplinarian, formed his band, funded by royalties from this hit song and shrewdly, captured the spirit of the time. He reportedly, did not like jazz or improvisation and liked his musicians to play the same solo every time they performed their feature numbers, although he was never reluctant to employ top jazz musicians. In 1944 he formed a band for a series of BBC concerts, although he was still with Geraldo. This BBC band formed the nucleus for his own band which started to record in 1944, and he was soon to be the top name band in the country, touring Europe and eventually the USA. 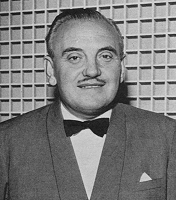 His repertoire was a mix of 'swing' arrangements featuring his star soloists, notably trumpeter Kenny Baker, and commercial ballads, featuring his team of vocalists. His 'Sunday Night Swing Sessions' at the London Palladium started in 1945 and for ten years were sell-outs. In 1956 the band toured the USA for a month and ended in triumph with the legendary Carnegie Hall concert that proved that the Heath band ranked with the best of the American bands. Ted Heath died in November 1969, but the memory of the enormous impact of his band in the late Forties and throughout the Fifties and Sixties, was perpetuated by the Ted Heath Band, led by fellow trombonist Don Lusher. Their final concert, after a total 55 years of existence, took place at the Royal Festival Hall in London on 4 December 2000, a CD of which, Ted Heath: The Farewell Concert, has been released on the Avid label. Many jazz musicians, (brief details below), spent time in the Heath band and their contributions shine through on many records. Below are brief notes on the various jazz musicians who spent time with Ted Heath in the 1940s and 1950s often in the early days of the band and the early days of their individual careers. 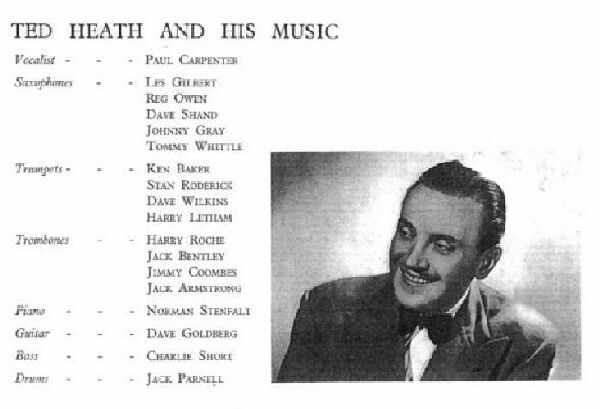 Other Heath sidemen, not generally regarded as jazzmen such as Roy Willox, Bobby Pratt and Don Lusher also made jazz records outside the Heath organisation. This page was last updated during November, 2008.